If your gloves don't protect your hands against liquids properly, you'll likely begin to feel uncomfortable fairly quickly. 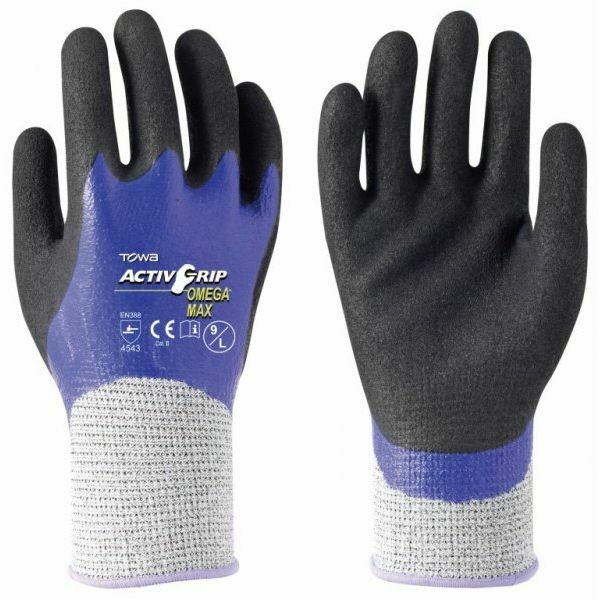 The Towa ActivGrip Omega Max Oil Resistant 542 Gloves are designed with a double nitrile coating on the palm and back to prevent liquid penetration. The gloves also feature a seamless 13 gauge HPPE and glass fibre liner to minimise hand fatigue, allowing you to work comfortably for long periods of time. These are designated Category II gloves, meaning they should be suitable for most medium-weight tasks. The gloves are designed to protect you against mechanical risks in wet, dry or oily conditions. The Towa Oil Resistant Gloves are available in five sizes to fit most hands. Please measure the circumference of your hand around the knuckles (excluding your thumb) with your palm open and your fingers together. Next, measure the length of your hand from the tip of your middle finger to your wrist.